Brightly colored and crafted with high quality cotton fabric – the Currambera represents the South American zest for life and provides ultimate comfort. Perfect for sitting and lying down! Plenty of room to dream: Each hanging Lounger Chair allows you to both sit and comfortably recline - so that you can always go with the flow. Our integrated, stainless steel safety swivel allows for complete 360° rotation and prevents any knotting or damage to the suspension cords. 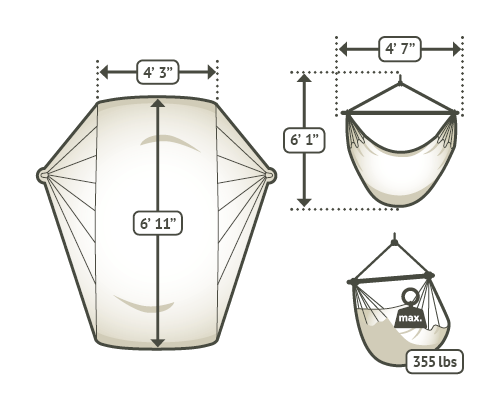 The installation of a hammock chair requires a suspension height of 6 ft 7 in - 7 ft 3 in, depending on the model. If the suspension is from a higher point, the hammock chair can be extended with a rope. The fabric part of the hammock chair can be removed and machine- washed: delicate cycle 86 °F!